The images have been updated to create a less vibrant environment. It's pretty laggy. 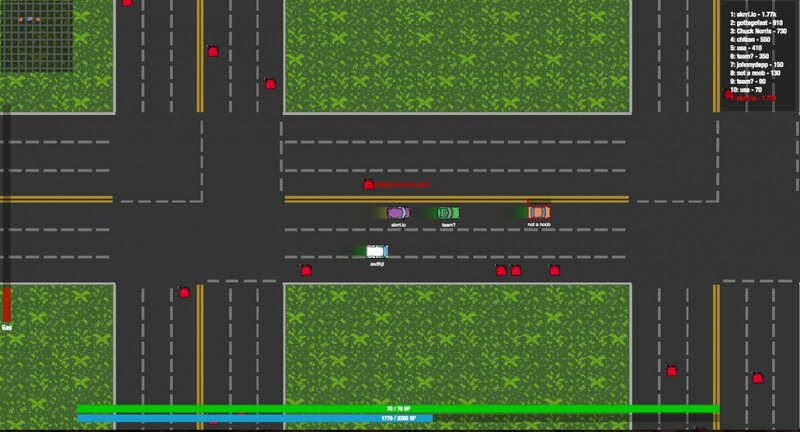 Numerous times I'd suddenly skip ahead or press a key twice because nothing was happening only to pull an unintended u-turn as the game caught up. That really needs fixing before you can launch a competitive multiplayer game. The game itself is pretty basic and lacking variety. More pickups and power ups would be a big help but also giving players more control over their cars would be good. The arena feels too big, even with the bots it's pretty empty, and I'd prefer hard barriers to the shadowed areas you have at the moment but that's a personal preference. Some sort of warning when heading out of bounds would be useful at least. With a smaller arena/faster pace and more control over your cars this could have potential but at the moment there's not much to see or do here. I don't seem to be noticing any lag (unless you played yesterday before my update), however, your other points were very helpful. Thank you for taking the time to give this feedback! I played less than an hour ago and it was very noticeable, but I use a lot of tabs so my browser was probably under a bit of strain to start with which could have contributed. I'm using Chrome. You're welcome on the feedback, best of luck.